What can you do when you are relisting a home that won't sell? It's a problem faced by people at all ends of the property spectrum. It happens to supermodels like Christie Brinkley, who is still trying to sell two of her $20 million plus home in the Hamptons. But what about the rest of us? What can we do when we have a home that won't sell? The best thing an agent or homeowner can do is try something different. One of the best things to do is to try new photos. Maybe it needs some different angles to show the connections between spaces. Or maybe a twilight shoot would help if it had previously been photographed during the day. Perhaps some drone shots would help if the home is on a sizable block of land, or is in close proximity to a river, forest, or beach. Of course, maybe some higher quality images for needed. If an inexperienced or low-cost photographer had been used the first time then it might be worth investing in some high-quality real estate photos in order to attract the right kind of buyer. "It’s not the number of pictures that helps at all, but the quality of the images used, which is why it’s so important to hire a high quality photographer, and not just hire the cheapest real estate photographer in town." Don't discount the difference that quality images matter with homes at the top and bottom of the market. For example, an average home in an average neighborhood, when presented with impeccable images, is going to stand out head and shoulders above every other property in the same price bracket. That's going to draw lots of lots of buyers who are looking for value in what they purchase. If you are looking for a high-quality real estate photographer then search for a photographer in your area here at BestRealEstatePhotographers.com. Of course, you may also try some extra services beyond photography, if that would help as well. A lot of homes these days use video tours together with high-quality photography. Another option is a floorplan. An NAR survey from last year found that 55% considered a floorplan to be a very useful feature in a marketing campaign, and was in the top 3 of the most requested features for buyers. Some homes take a while to sell, and they need a price drop. Basketball superstar Steph Curry purchased a home in California in 2015 for $3.2 million, and put it on the market 14 months later for $3.6 million. However, after a couple of attempts at selling the home it eventually sold for $2.94 million in 2017. "In my experience, the formula comes down to price + condition + exposure = a sale." I think that's absolutely right, and it is that combination of the price of the home, the condition of it and how well it is presented, and the marketing and exposure that the listing receives. When the mix is right then a home sells quickly, but if one of those elements is out, such as the price, then it can take a lot longer to sell. The final option, as we mentioned above, is to make changes to the condition or presentation of the home. For example, if a home has dated furniture, or walls that haven't been painted in 20 years, then bringing in a property stylist to refurnish the home, or a painter to update the wall colors, can help enormously. I've seen many homes get a fresh look with new photos, and it sells within days after being on the market for months without a buyer. "Our team recently worked on a new five-bedroom home, and created a high-end soft industrial scheme based on the property’s good natural light and premium finishes. The buyer was the first person who saw the property, when it was empty. After seeing it furnished, her offer increased from $4 million to the final sale price of $4.35 million." "Home Staging Brisbane owner Imogen Brown says a house she styled for $8000 on the Gold Coast had previously attracted offers of no more than $890,000. After styling it sold for $1.055 million." So styling a home can definitely help attract buyers, and those buyers are often willing to pay more for that home, making property styling a smart investment. 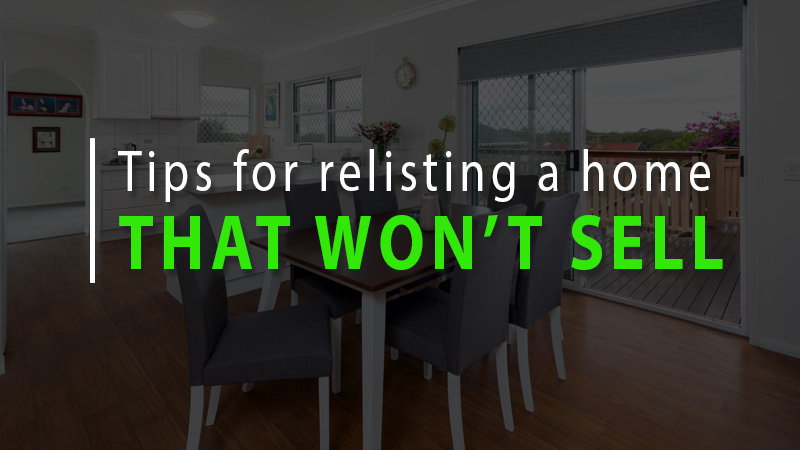 So there are a few options for what an agent or seller can do when relisting a home that refuses to sell in that first two or three weeks that it's on the market. You don't want to be waiting around forever, but instead take steps to change the marketing, the presentation or the price, and get that property moving!